Hello Doodlebug fans! Jennifer here and today I have a project to share that features the new Daily Doodles line, as well as the Sugarplums collection. 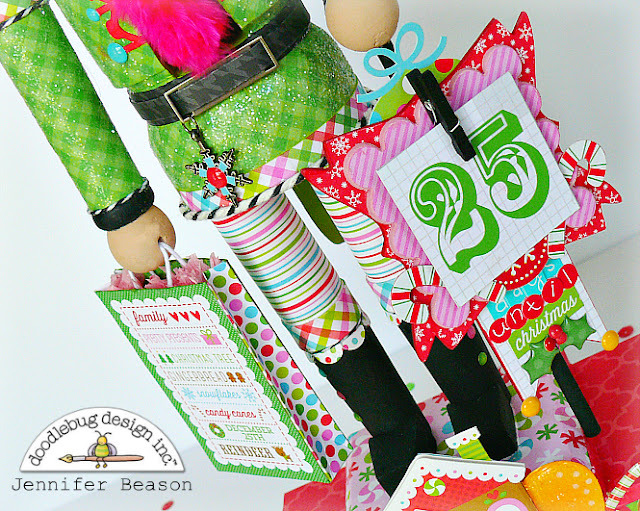 Christmas countdowns are always a big hit with my kids, so I created this Nutcracker countdown for them. Hope you enjoy it too. 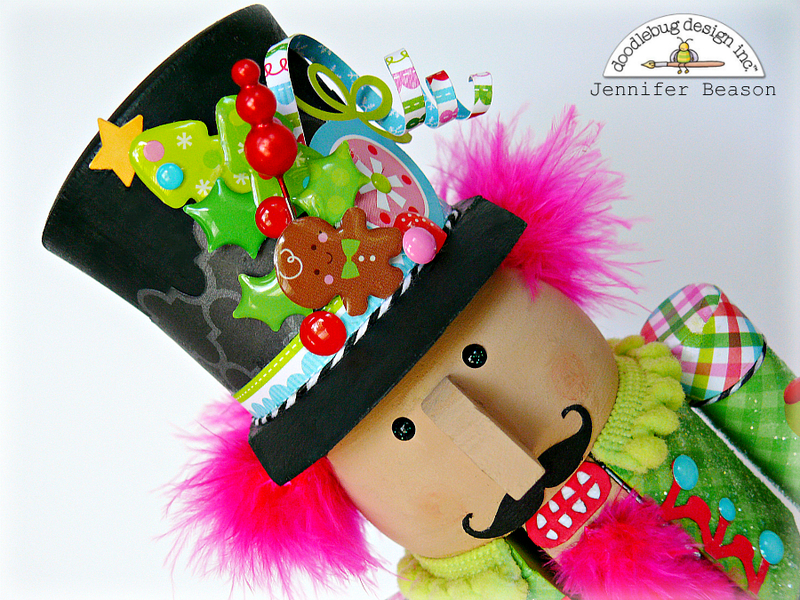 I used the patterned paper side, of a black daily doodle page to add a fun pattern around the nutcracker's hat. I also used lots of sprinkles, an ornament sticker and a thin paper strip, that was curled to add a little whimsy! Regular doodle twine was used around his hat, cuffs and shoulders. Then some Chunky Twine was glued around the hem of his coat. To create the belt, I used the hounds-tooth patterned paper, from the front side of the black Daily Doodle page and a metal ribbon slide. Vinyl numbers were a placed in the center of the Daily Doodle squares then cut out. The sign was made up of chipboard pieces that were layered together and attached to a wood dowel. 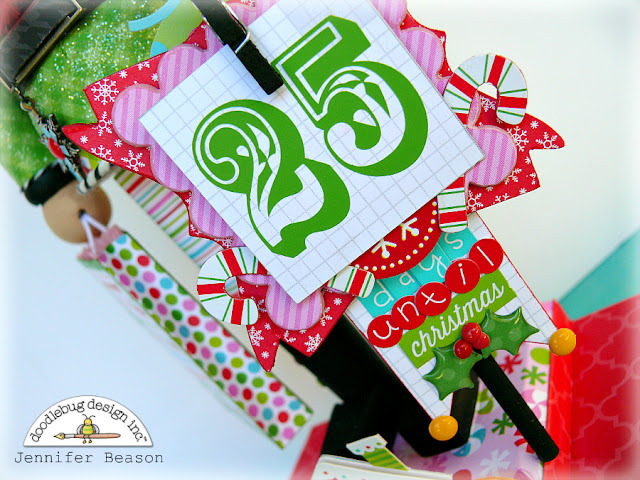 A small clothespin was glued onto the scalloped square and used to hold the countdown numbers in place. Candy canes, Teensy alpha stickers and more sprinkles were added to the countdown sign, as well. As you can see I used the red Daily Doodle patterned paper to cover the top of the base. 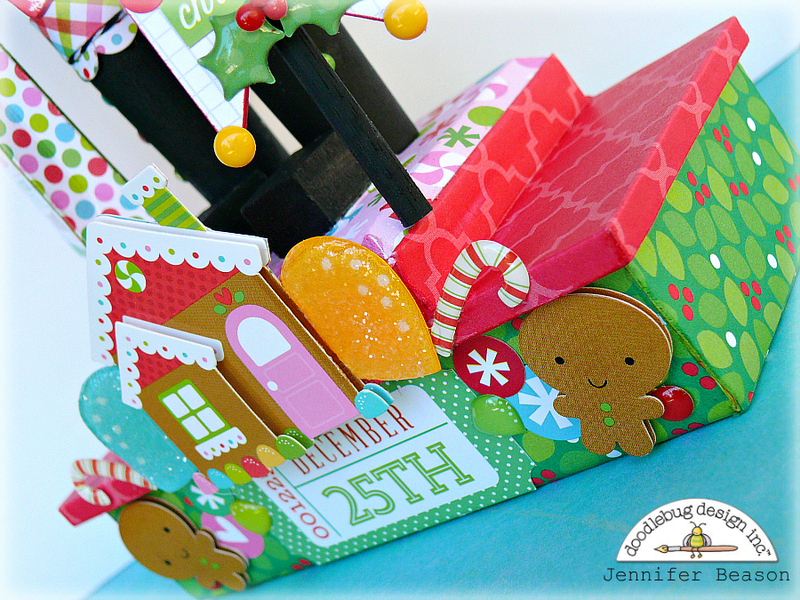 Then gum drops, candy canes, gingerbread houses and men were used as embellishments. 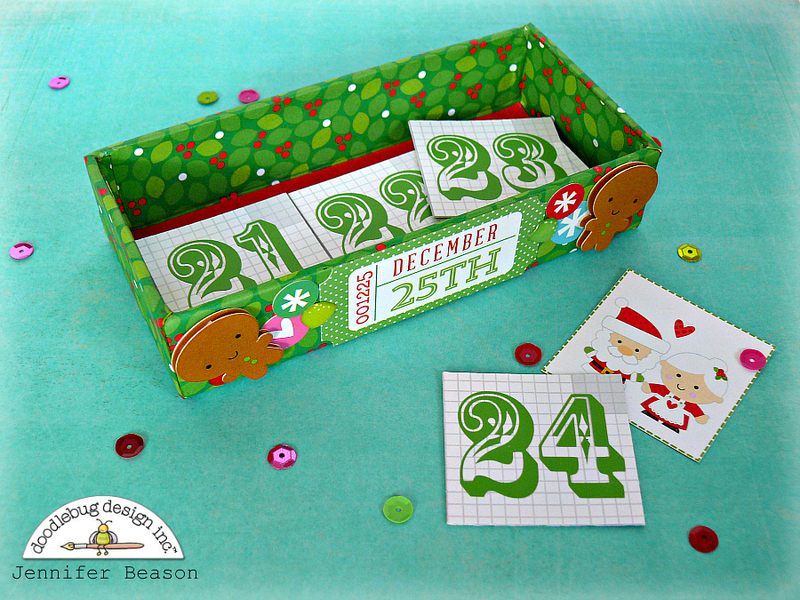 Since the base of the nutcracker is a box, you can store the rest of the countdown numbers inside. This is fabulous Jennifer, I love everything about it! Amazing work Jennifer! This is incredible! This is simply awesome. I love everything you create. 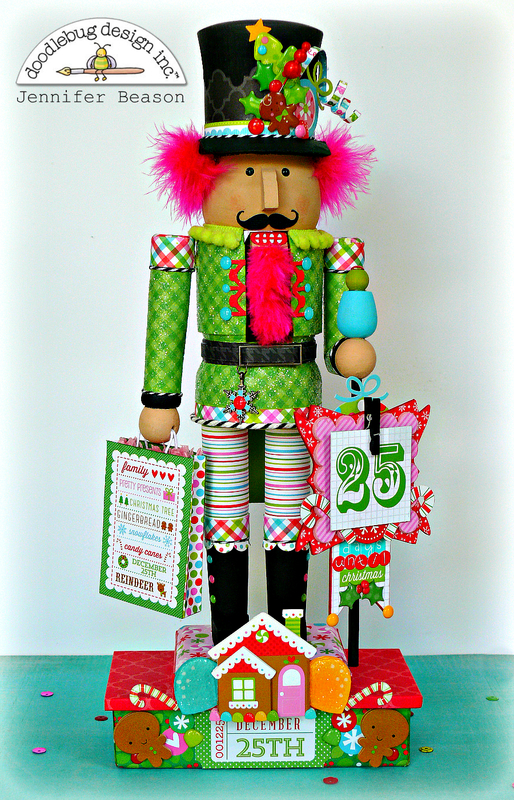 Where did you get the nutcracker? I would love to make one. I'm pretty sure I got it at Hobby Lobby! Wow! Such an amazing project, I absolutely love it! 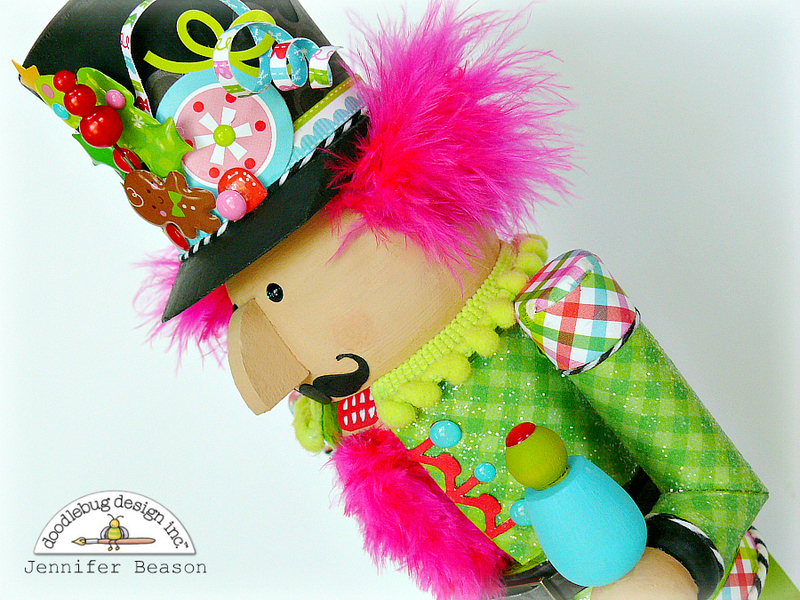 Such a great way to add character to a nutcracker by covering and detailing hime with gorgeous Doodlebug goodies! And the countdown component is my favorite, the kiddos will have so much fun with that! This is definitely pinned on my Doodlebug board! Wow Jennifer! You are so creative! Love your project! oh my goodness! This is absolutely wonderful!! Love it!! Wow, this is amazing! I love all of the details, thanks for the inspiration. Wow - this is fabulous! 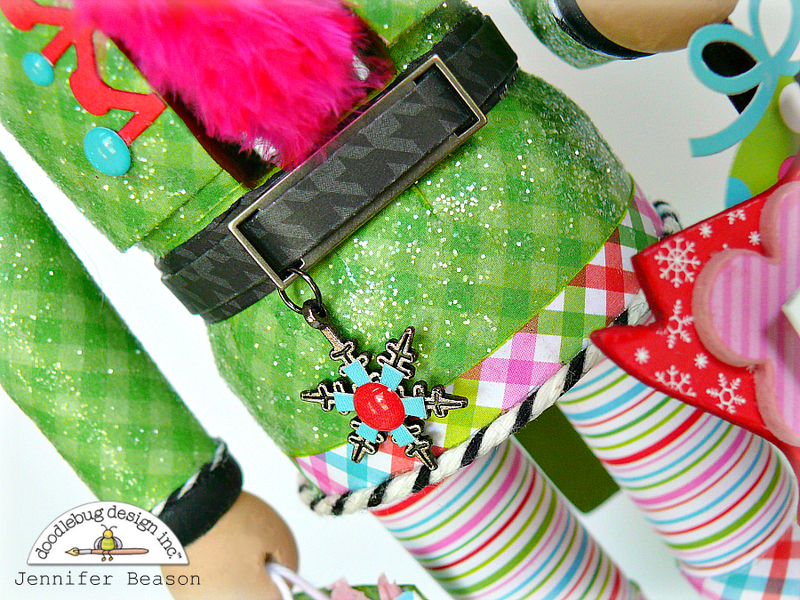 I'm not really a fan of the Nutcrackers, but THIS one is just gorgeous and I think I just may have to make one for someone in my family! This is just so so amazing! I love all the little details! Wow, what an amazing project! Wow!! What a stunning project!! You're so creative!!! Pinning this! AMAZING and SO WONDERFUL!!! What clever work and such attention to detail!! !